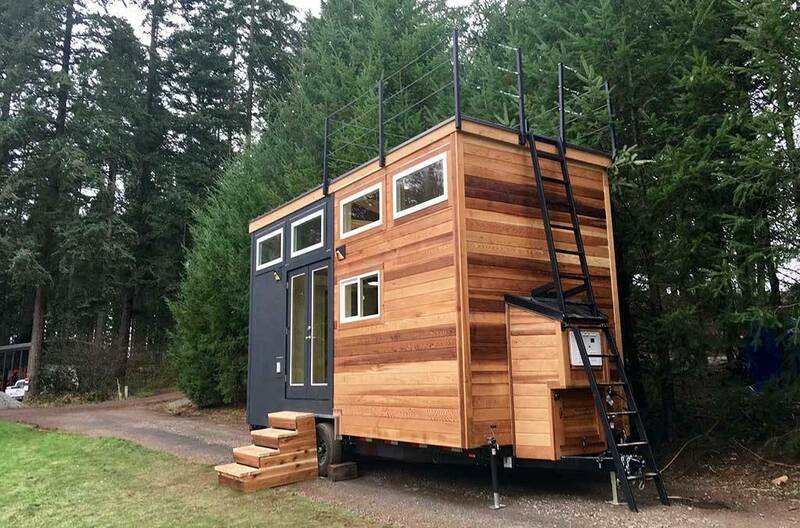 Working from home isn't an issue with this tiny house design. The tiny house has features that will allow one or two people to work comfortably at home including a separate desk area on the main floor. The floor plan is set up in a way that there is a great distinction between lounging space and workspace. That's all thanks to the partition bookshelf that does double duty as a separator and a storage space. There is also a beautiful small lounging space up in the second loft as well. Beyond the workspace nook, there is the bathroom which is decked out in some gorgeous and ornate tiles. The bathtub is also something to be desired even by those who aren't living tiny. Behind the workspace is a closet which would be great for organizing clothes or paperwork and above is the main sleeping loft. The entire space has a midcentury modern style to it, which is very laid back and relaxed. Plenty of wood finishes and white or cream accents help to keep the place feeling light and airy while also contributing to making it feel more spacious. The kitchen might seem a little small, but it would be perfect for someone who mostly cooks using a stovetop. There is a full-sized high-tech fridge as well which ensures there will always be lots of storage for fresh food. One of the most incredible features of this tiny house, besides all of the great amenities inside, is the roof-top patio complete with real living grass. Maybe the grass is really greener when it comes to small house living. 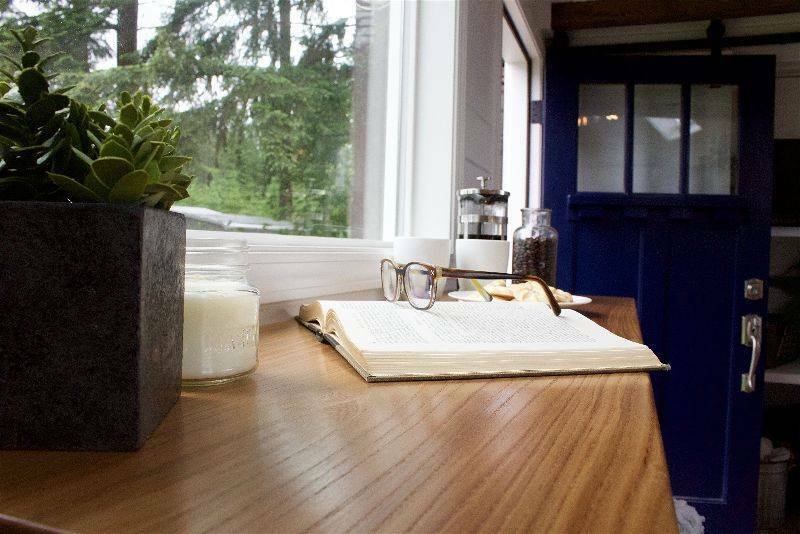 A comfortable and relaxed bohemian vibe is what the Apothecary Tiny House is all about. 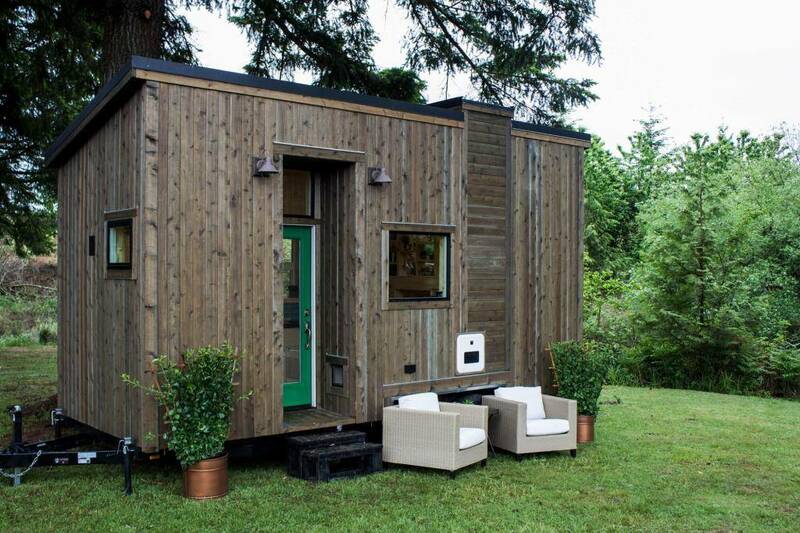 This tiny house was designed and crafted by Tiny Heirloom a company based in Oregon. 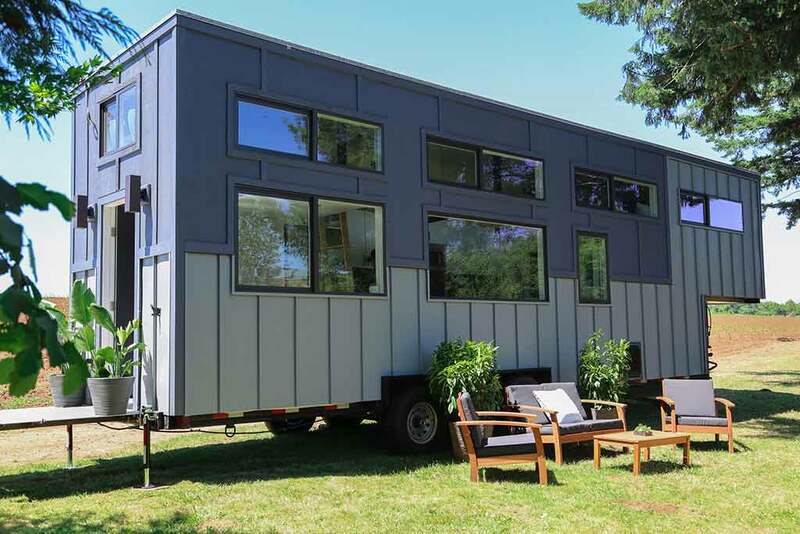 The 24 foot long by 8.5-foot wide tiny house on wheels has so many exciting and innovative features that would make the home a dream to live in. Starting with the eye-catching emerald green door that is set in a recessed doorway. This is such a great idea for a tiny house design because it creates a sheltered porch area without having to implement anything that protrudes from the sides of the home. Within the home, you'll see many different storage shelves have been carefully built into the floor plan, including one that acts as a divider in the loft as well as a display shelf. This loft is also pretty impressive on its own because you're able to stand up in it, unlike other lofts. This is made possible by the lower ceiling on the main floor bedroom below, which is a lovely, cozy space. Since we're mainly laying down in our bedrooms the lower ceiling works well for a tiny house bedroom. The tiny house design also boasts a fully equipped kitchen with full sized appliances and a gorgeous copper sink. This home may be tiny, but it packs a lot into its small design because of all of the smart design ideas the designers and builders came up with. Proving that a small space can sometimes function better than a large space when it's properly designed. 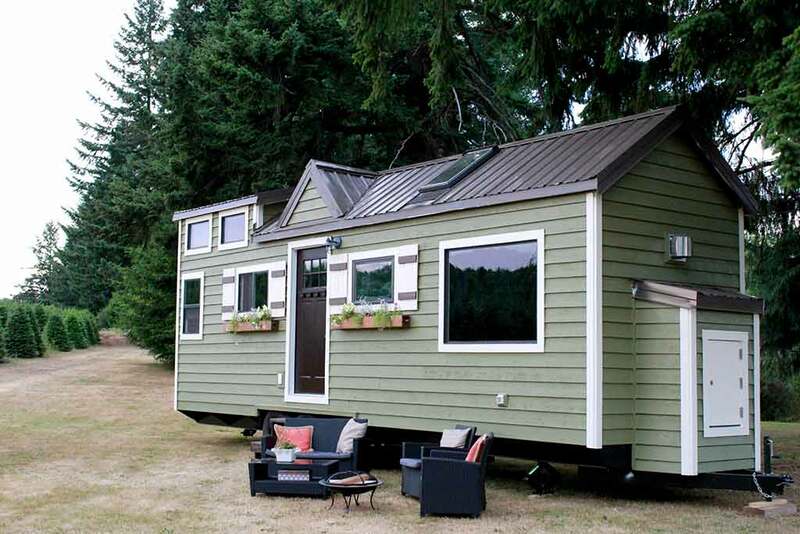 Here is a perfect example of how a family with children can live comfortably in a tiny house on wheels. Families are choosing small house living for many different reasons, but one of the primary reasons is so that they can have more time together as a family. Living smaller is a great way to own a home while still being able to save money. When your home is designed as nicely as this Tiny Traveling Dream Home is, you wouldn't feel as though you're sacrificing much either. All of the amenities of a modern conventional home are included in this small space, and the design has so much to offer as well. With the kitchen at the heart of the home, it's perfect for family living and daily routines. No family home is complete without a full sized oven and stove which this home implemented. There is also an apartment sized fridge which isn't as large as a regular fridge but it still has a lot more space than a mini fridge. 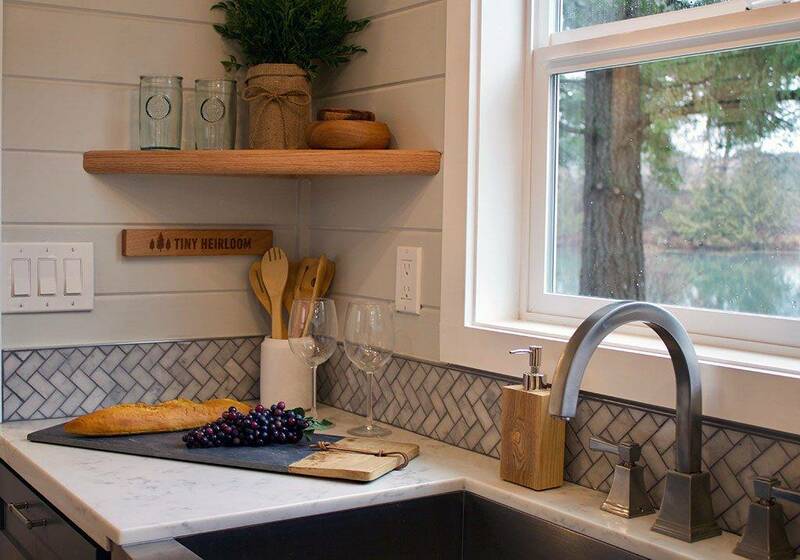 A farmhouse style apron sink is the perfect type of sink for this design because it looks great and functions well in the space. Parallel to the food prep area is a beautiful wood slab countertop with stool seating for the entire family to eat together. Instead of the usual loft bedroom for the kids, they opted to place their bedroom on the main floor which gives them enough room for little beds and their books and toys. There's also plenty of clever storage throughout this home which makes it even easier to live in. Here is a unique theatre inspired tiny house design called the Theater Home. 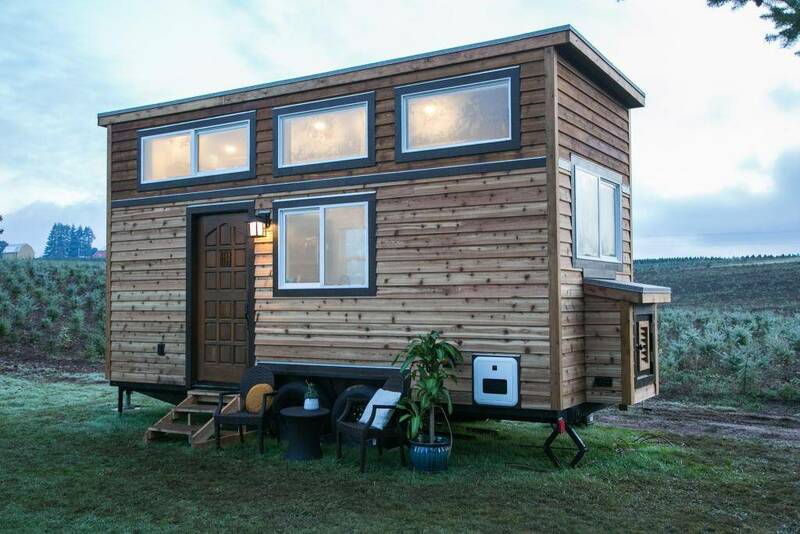 It was created and built by the talented tiny home builders, Tiny Heirloom based in Oregon. It doesn't look much like a theatre from the outside, but on the inside, in the living room, there is a plush, red tufted sofa that exudes the style and allure of old-time theatres in the US. The glimmering metal tile in the kitchen also helps with this glamorous old Hollywood theme, as well as the arched window in the kitchen area. The door is also painted a deep red for dramatic effect, and black is used in specific areas creating some depth. The home also features not just one but two loft spaces. One of the lofts has one bed while the other has two. The large bedroom is overtop of the bathroom and is accessed by stairs. It's even got enough ceiling height to be able to stand up in it. The bathroom underneath is stunning as well, with a huge soaker tub and gorgeous tile work. There's even a shower outside the tiny house that is linked up to the main water supply for the tiny house. So rinsing off from the beach in the summertime is a breeze. The kitchen is stunning, with granite countertops and dark wood cabinetry. There is also a large fridge and a full sized oven as well. A half-moon dining table is featured in the kitchen area with enough seating for four people, and there is always the possibility of building a deck off of the main entrance once the house is settled. Did this tiny house come right out of a storybook or a fairy tale? It looks like it may have with the Tudor style cottage look. This little English cottage inspired tiny house design is one that stands out from the rest. While many tiny houses tend to mirror the designs and styles of modern houses, this one takes some notes from the past and implements a traditional theme. This is another one of the magical bespoke creations of Tiny Heirloom a company that strives to create the perfect tiny home for each of their customers. In this case, the client wanted something that would take them back to a simpler time, and they wanted that whimsical, English Tudor style. The exterior is embellished with the traditional Tudor siding including the white base with the brown lines. They even added in some faux brick and cedar shake shingles, as well as a very prominent door complete with metal detailing and a dragon's head knocker. The English style of design is continued on the interior of the home while balancing the old with some new style elements. They carried on the brown wood exposed strapping inside the home which gives it that cottage feel. A fireplace takes up one of the corners of the home, and it's adorned in some beautiful coloured tile that makes it very elegant. They also added a spiral staircase and a natural wood railing for the loft which brings in natural elements as well. Wait until you see the bathroom with the gorgeous mini copper soaker tub. This tiny house design is definitely a wonderful mix of stylish modern design and traditional charm. Farmhouses aren't just made for the countryside anymore. The country farmhouse style has always been quite popular in home decor in one form or another, and we're seeing a lot of it in tiny house design too. Since many tiny houses will be parked out in the country, this is the perfect style for them, especially if the owner loves that chic farmhouse style. This Rustic Farmhouse tiny house from Tiny Heirloom is one of the great examples of a rustic farmhouse style that's been merged with contemporary design concepts. Tiny Heirloom did a wonderful job of combining the two styles in this home with the perfect balance of wood finishes, white and muted blues and greys. Many of the finishes including the farmhouse porcelain sink in the kitchen and the industrial style lighting, down to the baskets and wire bins used for storage all point toward a farmhouse style. Then, there are also modern touches, especially in the kitchen where we see the gorgeous white quartz countertops and the induction cooktop. You can also see some modern touches in the bathroom where they used a slate grey tile with river rock for a very natural and modern look. They also implemented a mid-century modern sofa into the space in that airy blue tone that complements neutral shades. Everything flows seamlessly together creating one of the most comforting spaces. All of the luxurious linens and pillows also help to cozy it up too. Spending time in the Rustic Farmhouse is sure to bring calm and a feeling of being home sweet home. If you love neutral tones, soft light, and modern fixtures and appliances this home ticks all of the boxes. The NW Natural is another beautiful bespoke tiny house design created by Tiny Heirloom, a tiny house building company based in Oregon. Then home features the popular farmhouse chic style that everyone is going crazy for. We can see why the decor style is so popular too. It can take any space and make it feel like a welcoming and cozy family home. The neutral and lighter tones also help to make the smaller space feel larger and more expansive which is also a bonus. Also helping with that in this case, are all of the amazing windows that are distributed throughout the tiny house design. Plus, the French doors that open the home up even more. Another nice feature on this home is the built-in porch on one of the narrow sides of the home. The porch folds out when the home is parked and when it's in transit the porch and the awning act as a cover for the glass French doors. Inside the home, there are more great handcrafted features like this including the handcrafted concrete countertop in the kitchen and the handmade dining table and stools. The modern touches include the stainless steel gas range and oven as well as the beer tap that's built into the countertop. See if you can spot all of the exciting features of this tiny house and take notes from this incredible tiny house design. Blue always seems to be such a soothing colour which is why this tiny house has such a chilled out vibe. The Sapphire tiny house takes all of the different shades of blue and combines them with white and other light and neutral tones to create a very mellow atmosphere. Good thing blue is such an easy colour to mix and match too. All of the different shades of this colour seem to work so well together in this design. Of course, you have the light beachy blue on the exterior of the home matched with the white trim and door. Then, on the inside, the Sapphire blue sofa catches the eye immediately, and all of the other neutral tones seem to balance it out. This tiny house design features not one but two sofas, one being a stand-alone sofa and the other being a built-in bench seat with comfortable cushions. Since the bench seat is built into a bay window, it creates a charming little nook that would be perfect for curling up with a good book on a rainy day. There's even a small desk for writing if the mood strikes. T he kitchen features gorgeous granite countertops and white cabinetry with black and stainless steel appliances. Like most tiny houses built by Tiny Heirloom, as this one is, there are also skylights included in the design. Perfect for tiny house dwellers love star gazing or looking out at the clouds in the blue sky. Not to mention the cozy bed that would be so easy to take a nap in. Does a beach vacation on a tropical island sound like the perfect getaway for you? Then this tiny house might just be your favourite yet. The Tropical Getaway has that relaxed, no fuss style that would make anyone feel like their on vacation. This isn't an in-your-face type of tropical home design theme either, which is refreshing to see. Many tropical inspired home designs will have vibrant colours and bold prints everywhere. Luckily that's not the case with this Tropical Getaway. The exterior of the tiny house almost looks like a little wood cabin in the forest. Inside, there is even more wood, but with all of the rattan furniture and little tropical-inspired details, it's easy to see why they called it the Tropical Getaway. It's all in the details, as they say, and you can find hints of the tropical theme throughout the home if you look carefully. For example, the vintage style tiki cups or the leaf print art hanging on the wall. One of the cutest details would have to be the pineapple light fixtures at the entrance of the home on the exterior. They look gorgeous, but they also serve a fundamental purpose. Then, of course, who could miss the large wood burning art of the iconic Hawaiian turtle with the hibiscus flower in the centre? Plus, the tiki torches outside are a nice touch as well. One of the other practical features of this tiny house on wheels is the wonderful closet they included in the design. Afterall, we all know there can never be too much storage in a small space. Master on the Main is a simple tiny house design that has everything you need for comfortable small house living. The exterior uses natural cedar with a blue door and trim for a tiny home that looks good wherever it goes. The interior combines wood with the same blue used on the exterior, white and great lighting fixtures. This tiny house design has a nice setup with the kitchen at the front of the house with a full sized fridge, stove, kitchen sink and counter space. A sliding barn door separates the bathroom from the main living area. The bathroom has a shower, sink and toilet. There is a bedroom that has its own access to the bathroom, so you have some privacy from the rest of the tiny house design. Skylights help to fill this tiny house design with natural light and give a feeling of spaciousness. The Master on the Main is a great space to park beside the lake or to use as a lovely little getaway home or space of your own. The Master on the Main is a tiny house on wheels from Tiny Heirloom. 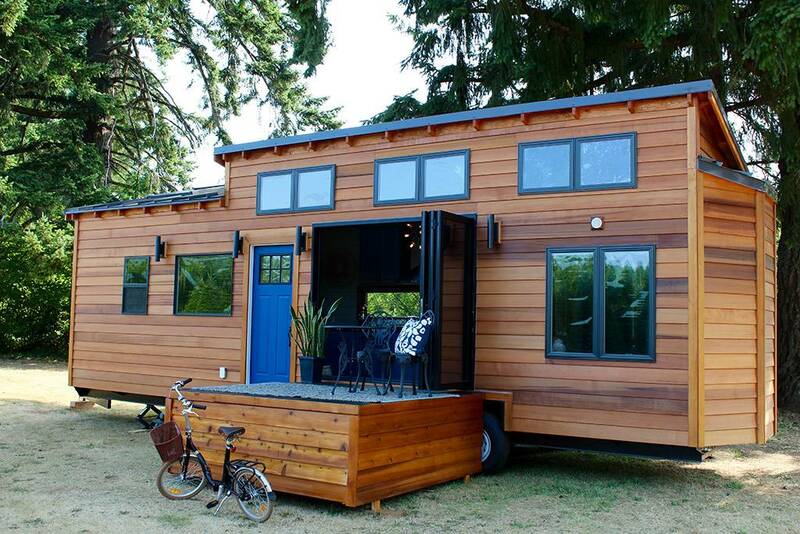 These tiny house builders are located in Portland, Oregon. Tiny Heirloom takes pride in using quality building materials and craftsmanship in all of their tiny house designs. 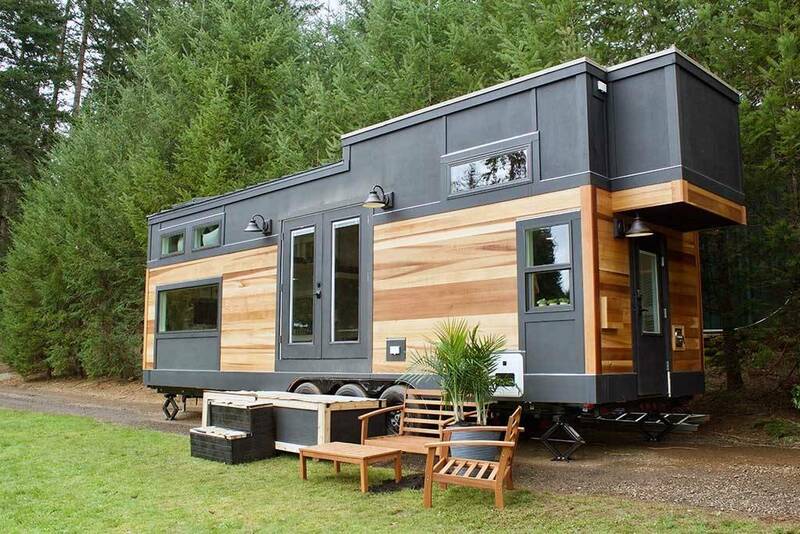 The Rustic Mountaineer is a tiny house on wheels that is true to its name. This tiny house design uses wood throughout from the floors, walls, ceiling and kitchen cabinets to give a warm and cozy feel. There is a garage-style door that slides up to open up the tiny home to the outdoors, which is nice especially when the weather is warmer out. The tiny kitchen has everything you need to prepare meals, with a tiny fridge, stovetop, oven and kitchen sink. There is plenty of storage built into this tiny house design to help put away your stuff. There is an upstairs sleeping loft that is accessed by stairs with a rustic railing that suits the style of this rustic design. There is a pullout table that tucks away nicely when not in use. The living area has a high ceiling, perfect for the antler chandelier and large windows which helps to give a spacious feel. The bathroom is a good size with a stackable washer and dryer, a bathtub, sink and toilet. It's easy to imagine the Rustic Mountaineer parked beside a lake or close to the mountains to take in the views. You will find the Rustic Mountaineer at Tiny Heirloom. Tiny Heirloom are tiny house builders located in Portland, Oregon. 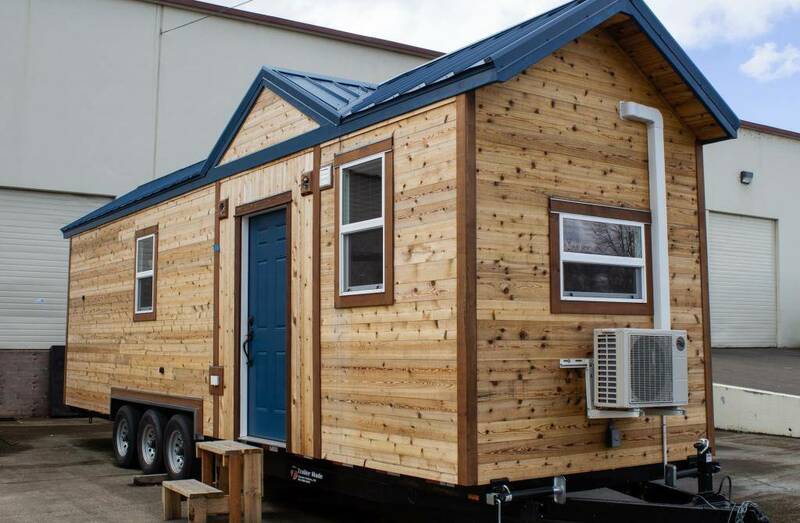 You can choose one of their Signature Series tiny house designs, a diy shell for people who like a challenge or work with their designers for a custom tiny house design of your own. Tiny Home, Big Family is a tiny house designed for a family of five. 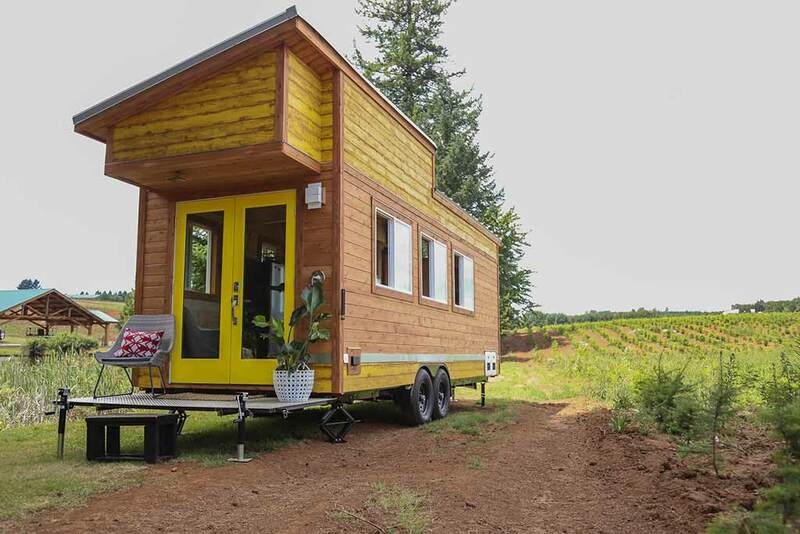 The tiny house on wheels is 33 feet long with multiple separate living areas. Inside the space is a custom moving wall system that depending on the positioning can form a bedroom or extend the size of the living room. When the moving wall is pushed against the back wall it helps to open up the living room which gives a more spacious feel and when pulled away from the wall it exposes two custom folding bunk beds that fold down from the wall. Above the bunkbeds, there is a fully enclosed sleeping loft for the parents which gives them some privacy and offers views to the sky with a skylight that opens above the bed. This tiny house design also has a full secondary loft that is opposite the master loft which also has a skylight and built-in shelving. The bathroom splits in two with sliding barn doors to help give the family some needed privacy. The tiny home has a beautiful gourmet kitchen with a custom retro fridge and stove top. Tiny Home, Big Family is just one of the tiny house designs you will find at Tiny Heirloom. These tiny house builders are located in Portland, Oregon and they can help bring your tiny house dreams to life. 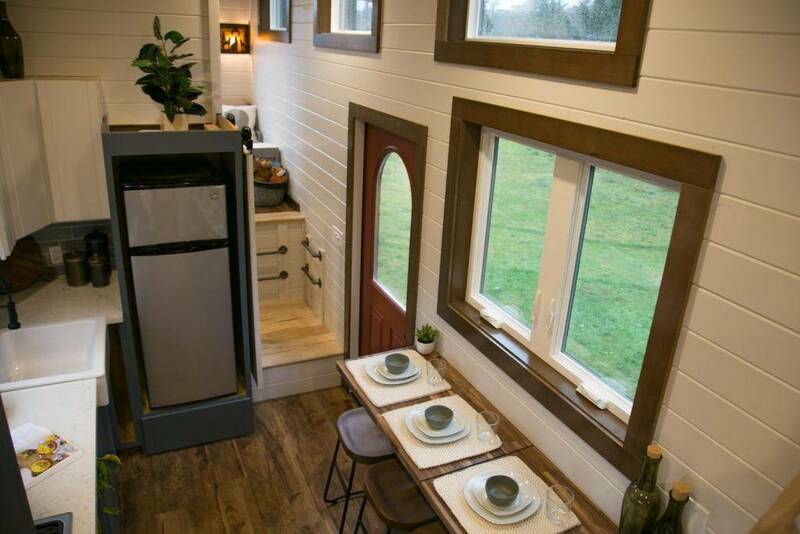 The Breezeway tiny house on wheels is a modern tiny house design with everything you need. The Breezeway is a beautiful design inside and out. The exterior combines natural wood with dark greys and a custom wood door for a stylish look you will love. Once you step inside the Breezeway, you will be amazed at the use of color, texture and style. For starters, to get into the Breezeway, there is a custom door on one side and a rolling door similar to a garage door on the other. When you leave both doors open, you get a nice flow of fresh air and a room with a view. The doors open into a nice sized living area with lots of light. The interior combines wood with white and blues for a space that feels unique and interesting. The kitchen in the Breezeway is beautifully done with blue kitchen cabinets, white countertops, an apron sink and stainless steel appliances. There is a dining table/counter built onto the other side of the kitchen that sits in front of a window for a view. The modern bathroom has a sink, toilet, washing machine and a nice sized shower. The Breezeway has an upstairs sleeping loft. The Breezeway tiny house design is just one of the tiny houses on wheels you can choose from Tiny Heirloom. Tiny Heirloom is located in Portland, Oregon. You can choose one of their tiny house designs or work with their design team to bring your custom tiny house dreams and visions to life. With a name like Home of Zen, you can't help but want to take a look inside to see what this tiny house design is all about. Right from the start the Home of Zen has clean lines, with an exterior that is split between natural wood and dark grey. The Home of Zen has clerestory windows that fill the tiny house design with light, but still offers a bit of privacy. The Home of Zen has a rooftop patio which provides the perfect spot to enjoy the view. You enter the tiny house design through the french doors which are also nice to leave open on a warm day. Inside this tiny house design, there is a lot of white with wooden floors and a wooden ceiling. The Home of Zen has a cozy living area where you can sit back and enjoy the surrounding scenery through the french doors. The kitchen is a step-down from the living area and has everything you need to prepare your meals. The Home of Zen has two sleeping lofts, one which is accessed by a ladder, with the other loft accessed by stairs. The stairs have a pullout table, that easily tucks away when not in use. There is a tiny bathroom that has a shower. The Home of Zen is a good choice for all of your small house living needs. 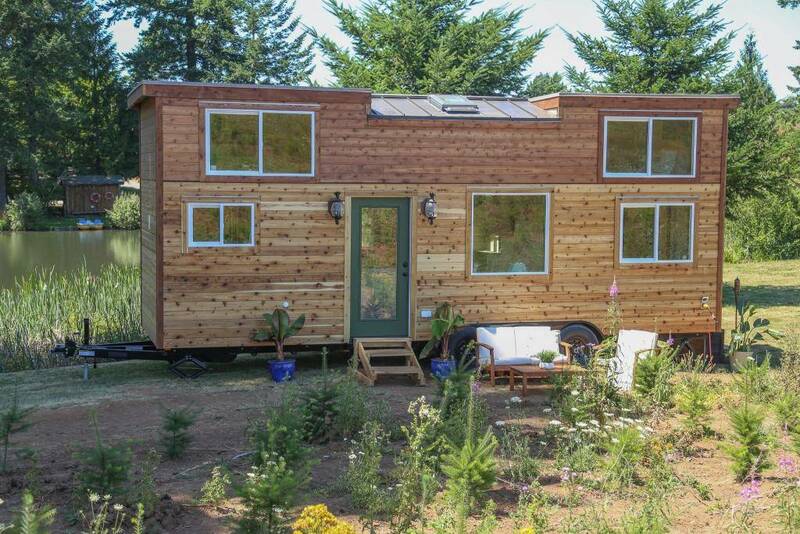 You can find the Home of Zen tiny house on wheels at the Tiny Heirloom site. Tiny Heirloom has a variety of tiny house designs available; they will also work with you on a custom tiny house design and have diy shells for people who want to work on a tiny house themselves. Vintage Glam might just be your favorite tiny house design yet. Just like its namesake, the Vintage Glam has rustic details throughout for a tiny house design that feels cozy yet elegant. 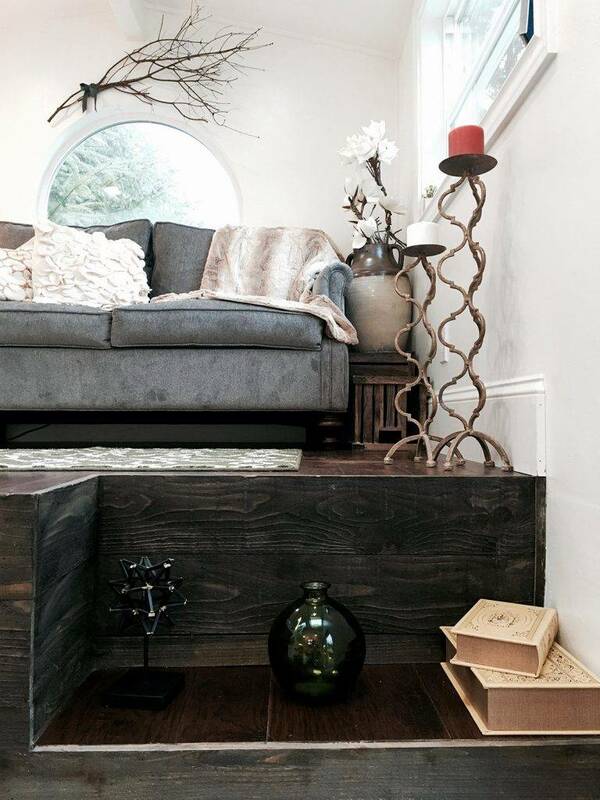 At one end of the tiny house design, there is rustic reclaimed wooden steps that lead up to a living area with a couch. The stairs have plenty of concealed storage to help free up space. This area of the tiny house design is lit with a beautiful chandelier that is in line with the round window located behind the couch. The kitchen has white kitchen cabinets on either side of the tiny house design with an apron sink and farmhouse style faucet, with marble looking kitchen countertops. This lovely little kitchen has stainless steel appliances for all of your cooking needs. The Vintage Glam tiny house design has white walls and ceiling with wooden floors that help to tie the tiny house space together. Unique shelves help to provide storage space in different spots throughout the tiny house. The bathroom has a lovely vintage shower head with hand held sprayer, which is all part of a vintage clawfoot bathtub. Skylights and windows fill this tiny house design with natural light. And if that weren't all enough the exterior of this tiny house design looks just as good. Painted in a beautiful shade of blue, with white trim, french doors, and a tiny covered wooden patio that has pot lights so you can enjoy sitting outside at night. 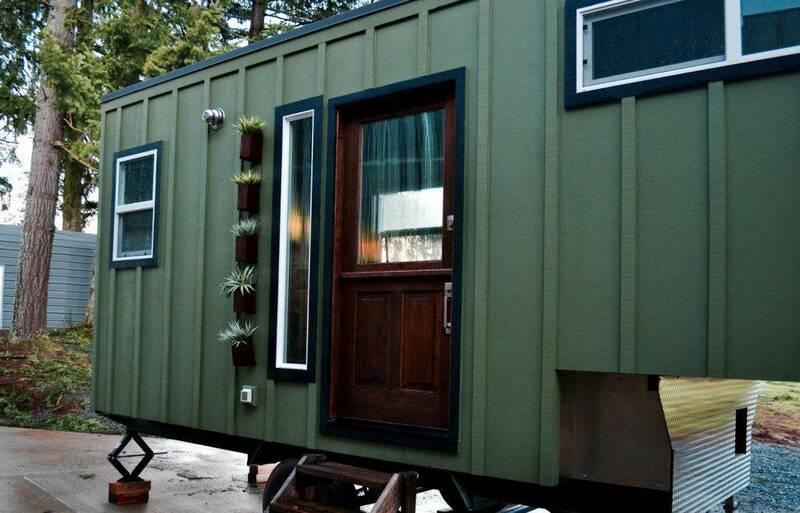 The Vintage Glam is just one of the tiny houses on wheels you will find at Tiny Heirloom. Tiny Heirloom is located in Portland, Oregon and they take pride in using quality craftsmanship and building materials. The Ultra Modern tiny house is just that, a very modern and contemporary home with a ton of style. On the outside, the tiny home appears to be very modern right from the start, and this modern look is beautifully carried on into the interior of the tiny house design too. Inside, they've combined different tones of walnut wood which is a great wood to choose to get that modern look. Then, they painted the walls all white for an airy and light feel and used a striking grey glass tile for the backsplash in the kitchen for contrast. All stainless steel appliances for the kitchen and a large stainless steel basin for the sink. On the way to the bathroom, there is some excellent storage space for linens and other items, and then the bathroom includes a sizeable ceramic basin sink and an all in one washer and dryer unit. Instead of installing a regular bathtub, they went with a steel basin which looks modern but also industrial too. The main bedroom suite is up in the loft with two windows and plenty of room for the mattress and the small bedside tables. There is also another loft which could either be used as a sleeping area or another storage area. One of the coolest features in the home is the netted walkway above the kitchen which works as a pathway from one loft to another. Great if the tiny house dwellers have kids or if they are using the other loft as their closet area. This stunning modern take on tiny house design is refreshing and inspiring, showing how a tiny house can take on any decor style the owner chooses. With a name like the Beachy Bohemian you just know it's going to be a fun design. The exterior of this tiny house on wheels has natural wood with bright sunny yellow doors and stained yellow and teal trim. The front of the Beach Bohemian has a small patio with enough room to sit and enjoy your morning coffee, and french doors that lead to this lovely tiny house design. Inside the Beachy Bohemian there are plenty of windows to let in lots of natural light, and high ceilings that give a spacious feel. The Beachy Bohemian carries on the exterior color scheme with natural wood, yellows and lots of teal throughout. When you step inside of this tiny house design, there is a nice sitting area with a live edge dining/work table that serves as a good place to eat or work. The kitchen in the Beachy Bohemian has everything you need to make meals with a good sized fridge, stove top, oven, kitchen sink and lots of counter space. The bathroom has a barn door with a sink, shower, toilet and unique wash basin with shower up above. There are two sleeping lofts, one with a desk against the wall and a bunkroom at the back of this Beach Bohemian tiny house design. The Beachy Bohemian is a tiny house design available from Tiny Heirloom, a family run business located in Portland, Oregon. Tiny Heirloom believes in sustainability, building their tiny homes using 100 percent renewable energy. The tiny homes from Tiny Heirloom are easy to have set up with solar power for clean, renewable energy. The Tailgating Farmhouse looks good wherever it's parked. With a blue wood exterior, white trim and a custom wooden door, this tiny house design looks good. Once inside you will see where this tiny house design gets its name with a farmhouse kitchen with an apron sink, grey kitchen cabinets with butcher block countertops, stove cooktop and stainless steel fridge. Inside this tiny house design, you will find white walls and ceiling with wooden floors, wooden beams and wooden trim throughout. There is a built-in couch in a cozy nook underneath a window, perfect to cuddle up with a book, and a couple of chairs to provide a nice living space. And the real surprise in this tiny house design is the tiny climbing wall perfect for keeping the kids busy. The bathroom in this tiny house design has a shower, sink and toilet. You'll be surprised to know that this tiny house design has two sleeping lofts and a bedroom in the back. The Tailgating Farmhouse is perfect for all your small house living needs. 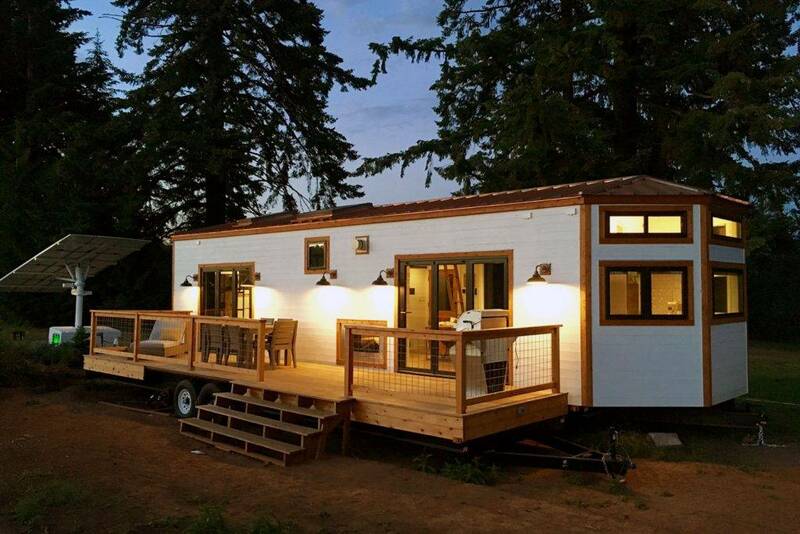 The Tailgating Farmhouse is a tiny house design from Tiny Heirloom located in Portland, Oregon. Tiny Heirloom has several tiny house design to choose from, and they will also design team will work closely with you to help bring your visions and dreams to life. Scandinavian design is known for its simplicity, its minimalism and functionality and this tiny house design does just that. The Scandinavian Simplicity tiny house on wheels has an exterior with natural wood, blue siding and a bright red door for a tiny home that looks good right from the start. Once inside the Scandinavian Simplicity tiny house design has white walls and a white ceiling that gives the home a spacious feel. There is a nice living area made bright with plenty of windows all around. The kitchen in this tiny house design has white cabinets and natural wood countertops with a teal and white backdrop. The kitchen has everything you need with a stove top and oven, kitchen sink and fridge. The tiny house design has a bathroom with a shower, sink and toilet. The Scandinavian Simplicity has an upstairs sleeping loft that is accessed by stairs, with windows all around along and a skylight to fill the space with light. Whatever your small house living needs the Scandinavian Simplicity is a good start. Scandinavian Simplicity is just one of the tiny house designs you will find from Tiny Heirloom. The tiny house builders are located in Portland, Oregon and pride themselves in quality craftsmanship and building materials. If you love the rustic style of tiny house design, then the Tiny Rustic Cabin is right for you. 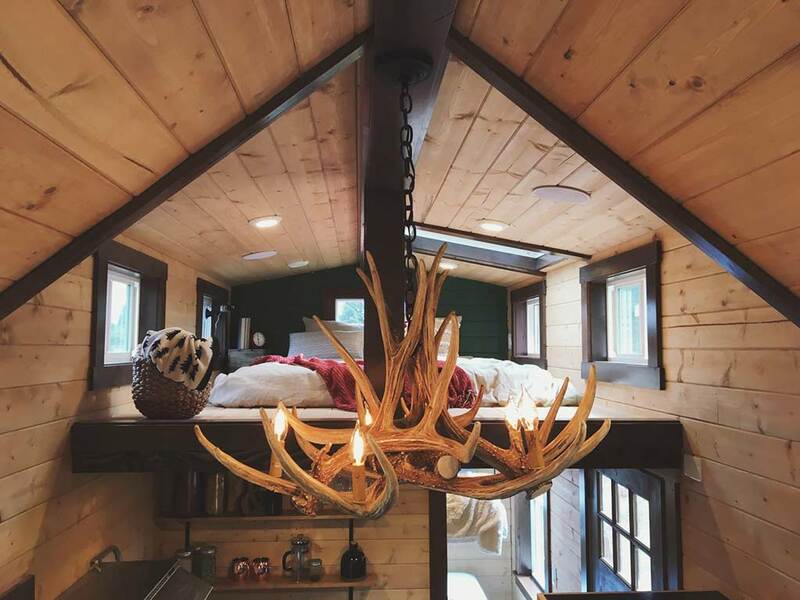 From the antler chandelier in the center of the tiny house on wheels to the stone fireplace, this tiny house design is beautifully done. The Tiny Rustic Cabin has a cozy living area right in front of the stunning stone fireplace that makes this tiny house space like no other. The kitchen has everything you need with stainless steel appliances, an apron sink and plenty of counter space perfect for preparing all your meals. This tiny house design has an upper loft for sleeping, with a skylight and windows to let in the natural light. The Tiny Rustic Cabin uses wood throughout with dark trim and forest green accents to further lend to the rustic design details. The Tiny Rustic Cabin is just one of the tiny house designs you will find from Tiny Heirloom. Tiny Heirloom is a family run business located in Portland, Oregon. The tiny house designs have unmatched quality and beauty. There is a level of attention and detail that goes into each interior and exterior of their tiny house designs that is above and beyond what you could ever dream. Whatever your reasons for needing a tiny house on wheels, the Tiny Beach House is a tiny house design to consider. With its grey exterior, white trim and black shutters, the Tiny Beach House looks good wherever it goes. Inside has modern, clean lines with light grey walls, light floors, white and wood trim. Stairs lead up to the sleeping loft where the clerestory windows let in a nice amount of natural light and plenty of shelving. There is an additional sleeping loft accessed by a ladder over the living room, perfect for when you have guests come over to stay. Downstairs is a living room space with a dining area that doubles as a desk. The kitchen has everything you need to prepare meals, with beautiful dark grey cabinets, a white kitchen countertop, an apron sink, oven, stovetop and fridge. The bathroom at the back of the space also has a washer for laundry. The Tiny Beach House is a tiny house on wheels built by Tiny Heirloom. This is just one of the tiny houses on wheels you will find from Tiny Heirloom, they also build custom tiny homes, and diy shells. Tiny Heirloom is located in Portland, Oregon. True to its namesake the Retro Southern Charm is a retro-style tiny home with a 50's style refrigerator, classic kettle, and gingham curtains for a unique look. The exterior of this tiny house on wheels sets the mood off right with its pale green wooden siding, custom wooden door and white trim. The kitchen along with its retro fridge has a tiny stainless steel oven with stove, with an apron sink and butcher block counters to complete the look. The dining area has built-in seats with a table that lowers down to become a bed perfect for when guests come to stay. Inside the tiny home, white walls and white kitchen cabinets combine nicely with the wooden floors, wooden storage cabinets and green accent wall. The bathroom space has a bathtub, sink and toilet. This tiny house on wheels has an upstairs sleeping loft. The Retro Southern Charm is just one of the tiny house designs you will find from Tiny Heirloom. These tiny house builders are located in Portland, Oregon. Tiny Heirloom tiny homes are easy to have a solar set up incorporated into them so you can power with clean, renewable energy if you choose. Also, their tiny house designs are built with 100 percent renewable energy. The Texan Tiny Farmhouse is just one of the tiny house designs you will find from Tiny Heirloom. The Texan Tiny Farmhouse has 210 feet of space, with two skylights over the bedroom loft. Below the bedroom loft is a large storage space that has shelves and two barn doors. This tiny house on wheels has luxurious finishes throughout. There is a floating breakfast bar set in front of a large window that has three drawers for extra storage. The Texan Tiny Farmhouse has white walls with wooden floors and beams for a tiny house design that feels spacious. The white kitchen cabinets and butcher block countertops also help to make the space feel light. The peaked ceiling in the Texan tiny house design lends to feeling of spaciousness, combined with lots of windows throughout to fill the space with natural light. The Texan Tiny Farmhouse has a modern bathroom at the end of the tiny house design. 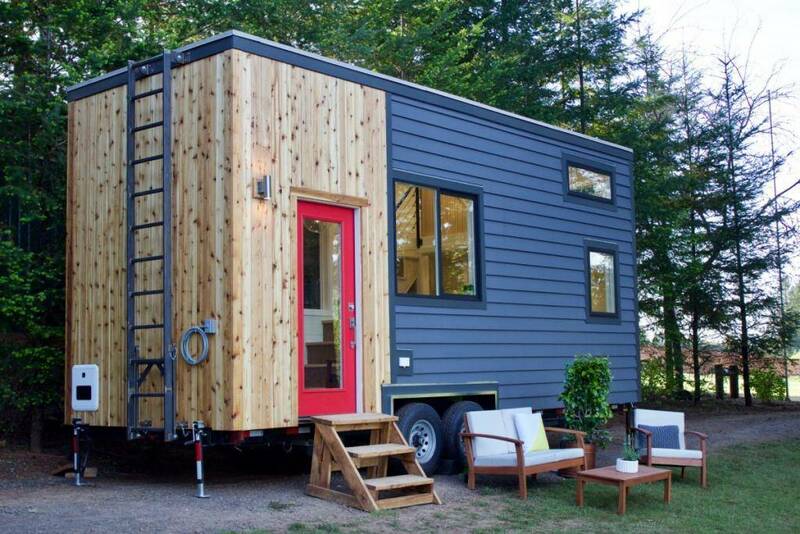 This tiny house on wheels feels much larger than its 210 square foot size. 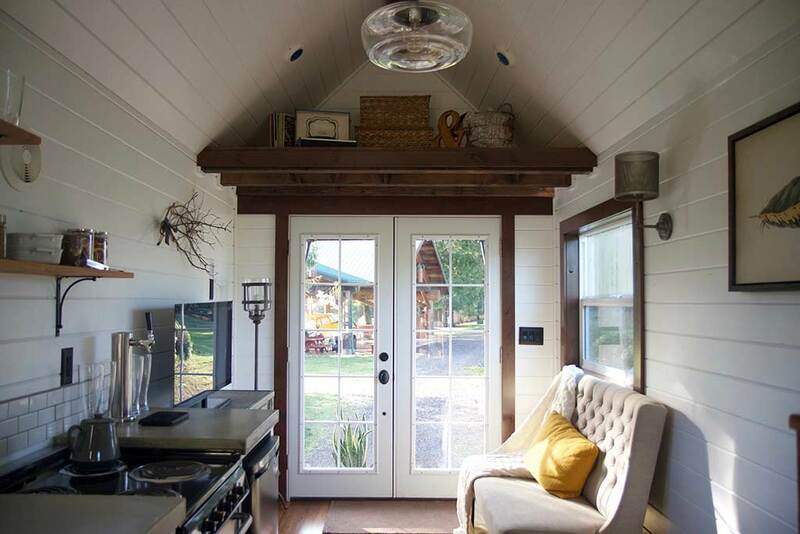 The Texan Tiny Farmhouse is a tiny house on wheels built by Tiny Heirloom builders in Oregon. Their tiny house designs use quality building materials and craftsmanship for their tiny homes that will suit your lifestyle and needs. The Hawaaiin Retreat is a tiny house on wheels that is going to change the way you think about small house living. The tiny house design includes a full-size chef’s kitchen with 19 feet of quartz countertops, two bedrooms, and a large outdoor deck. 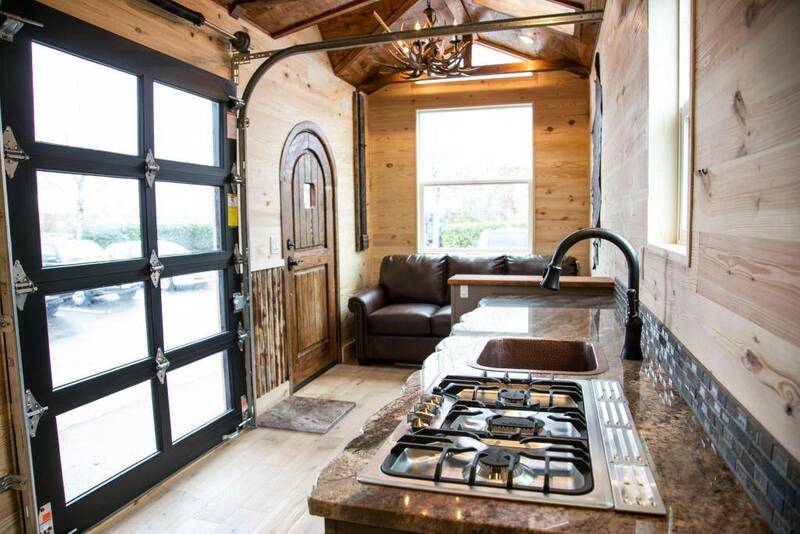 This luxury tiny home has a chefs kitchen at the end with a kitchen island, stainless steel appliances to include a stove, microwave and full sized fridge, which is something you don't often see in tiny house designs. The open living room/kitchen space has a fireplace and uses plenty of white for a spacious feel. A sliding barn door separates the bathroom from the main space, and you'll want to take a look at the modern bathroom with it's one of a kind skylight above the shower. The Hawaiian Retreat has two skylights and two sliding glass doors with a spacious deck and is hooked up to a solar panel array. 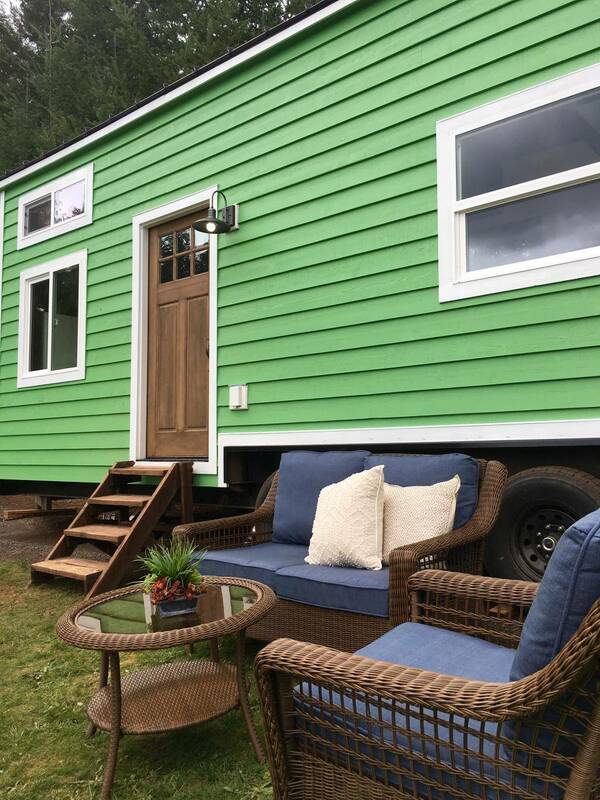 The Hawaaiin Retreat tiny house on wheels is built by Tiny Heirloom a family run business located in Oregon. Inside and out the Tiny Heirloom designs use quality craftsmanship and building materials. The tiny homes have a tight envelope that will stand up to any weather conditions that are thrown at them. Tiny Heirloom uses cedar siding on their exteriors and metal roofs that shed the rain and snow, and reflect the heat. Their metal roofs are made with 100 percent recycled building materials. 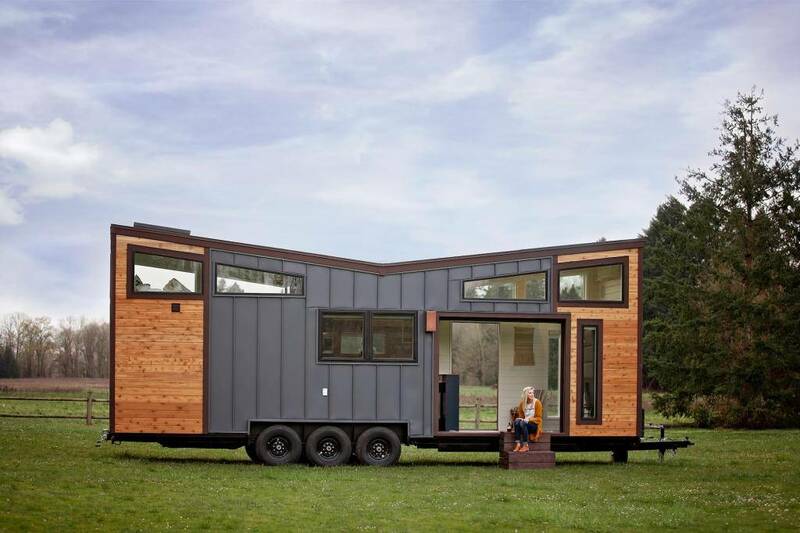 The Modern Mountain House is a tiny house on wheels that makes a statement from the moment you first lay eyes on it. With its beautiful natural wood and dark trim exterior, you can't help but want to look inside. The interior of the Modern Mountain House doesn't disappoint either, with its spacious design and plenty of details to make this tiny house design feel much larger than it is. This Modern Mountain House is a luxury tiny house design with two upper lofts for sleeping, a large living space, impressive kitchen and two fireplaces, one on the main floor and one in the master loft. There is a beautiful live edge wood dining/work table that tucks away when not in use. And the kitchen has quality kitchen cabinets in a nice grey with a stainless steel fridge, oven, stove top, and sink. The bathroom in this tiny house feels a bit like a spa with a shower that has stones in the details, and a bench inside. The Modern Mountain House is sure to impress, and will change the way you think about small house living. Tiny Heirloom is a family run business located in Oregon. The tiny house builders have a variety of tiny house designs available with each tiny home having unmatched quality and beauty. 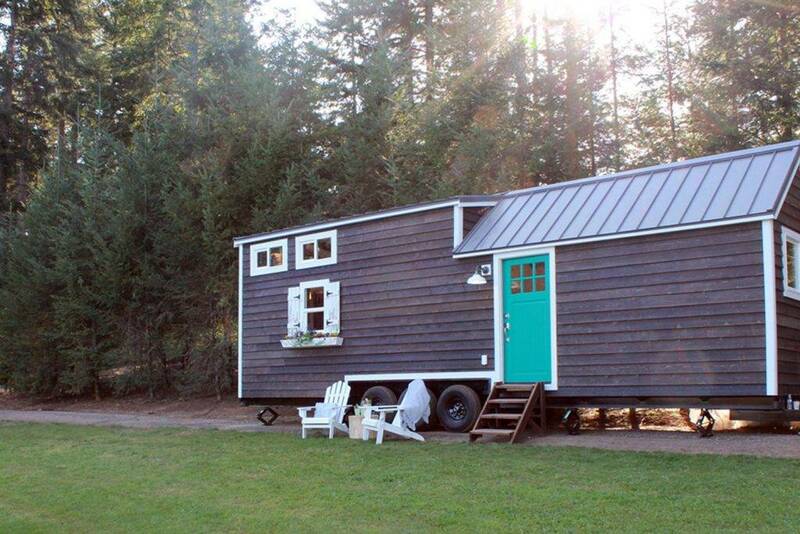 The exterior of this tiny house on wheels is what makes this tiny home unique. The exterior uses Shou Sugi Ban an ancient technique that gives a dark finish. Shou Sugi Ban is an ancient Japanese technique that preserves the exterior wood by charring it with fire. The unique process is an environmentally friendly way to preserve wood and to make it fire resistant. Inside of this tiny house design is quite the opposite with the use of light wood used throughout. The bedroom is tucked away at the back of the tiny home with a built-in bed with storage underneath. The bed sits beneath a window where you can wake up to the lovely views that surround you. And then in front of the bed is a built-in couch which helps to create a nice nook to lounge and sleep. Beside the couch is a built-in dining table/workspace where you can either enjoy your meals or work on the computer. The kitchen has plenty of counter space to prepare your meals, along with a fridge and sink. At the front of the tiny house on wheels, is a modern bathroom with a sink, toilet and one of a kind bathtub. 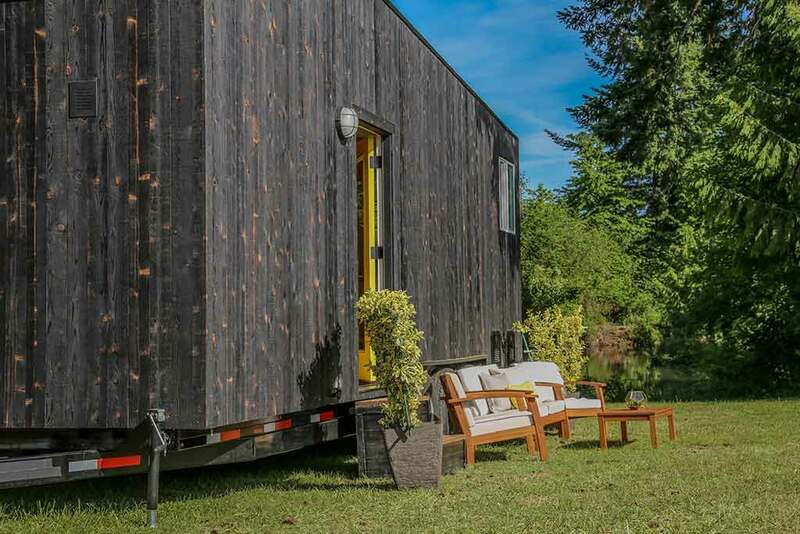 The Shou Sugi Ban is a lovely tiny house on wheels that is sure to suit your small house living needs. Tiny Heirloom is a family run business located in Oregon, U.S.A. 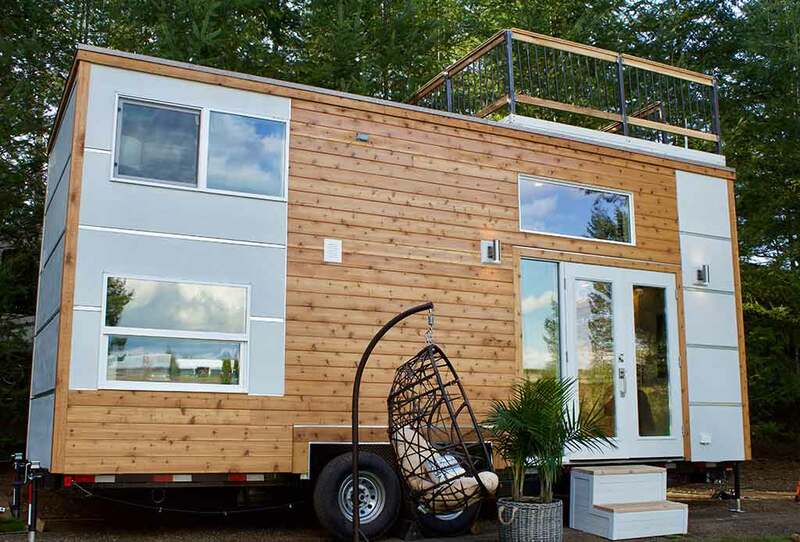 The Huntsman tiny house on wheels is sure to get your attention right from the start. Painted with a beautiful moss green with black trim and a custom wooden door, it will look good in any location. The Huntsman tiny house design has a wooden floor, wooden walls and dark cabinets throughout. This tiny house design has a cozy sitting area beside the raised bed and a tiny kitchen with all that you need to easily prepare meals. The bed is raised a couple of steps, with storage underneath the steps and underneath the bed. There is a bathroom with a shower, sink and toilet that is separated from the rest of the space with a rustic wooden barn door. The tiny wall heater on the wall is perfect for those cold nights. 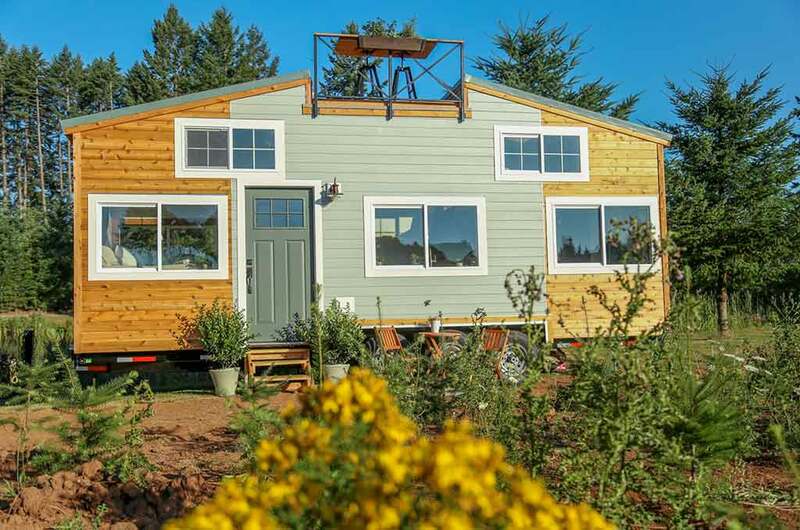 Tiny Heirloom builders are located in Oregon, United States. Tiny Heirloom prides themselves on creating a tight exterior envelope that will stand up to any harsh weather conditions. They use cedar siding on their exteriors and roofs that are either a membrane or standing seam metal roof. You can feel safe knowing that these metal roofs will shed rain, reflect heat and ignore the snow and ice. The metal roofs are made with 100 percent recycled building materials. 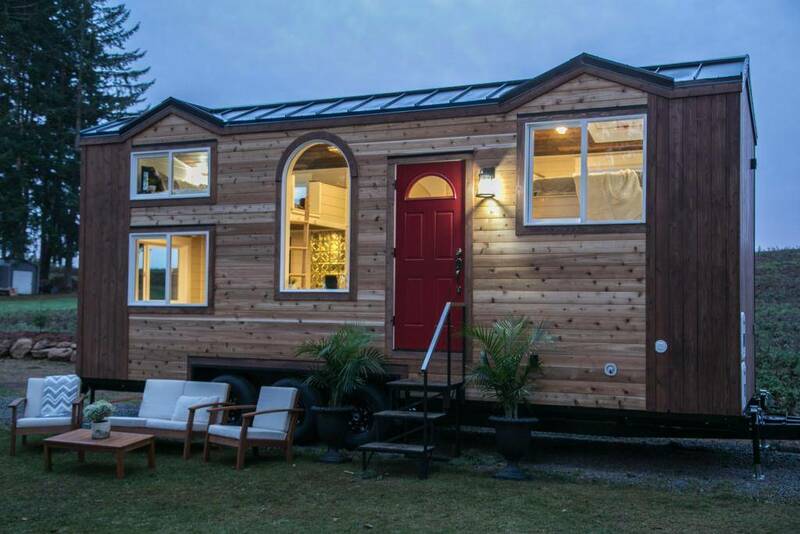 The Archway tiny house on wheels is one of a kind, and a tiny home worth taking a look at. From the moment you lay eyes on this tiny house design you are sure to fall in love. With a cedar-clad exterior, clerestory windows, custom wooden door and grey trim, this tiny home looks good wherever it's parked, and a good choice for all of your tiny house needs. Once inside you will find white walls, with teal accents, wooden floors and a wooden ceiling. The kitchen has teal kitchen cabinets with a butcher block countertop, a dining countertop that can also double as a desk, stainless steel appliances to include a fridge and microwave, oven and stovetop. There is a storage loft overtop of the bathroom. The bathroom is hidden behind a barn door, with a unique vanity and sink that you have to see. At one end of the tiny house design is a built-in bed/couch nook with storage underneath and shelving that serves as the headboard. Tiny Heirloom is located in Oregon. These tiny house builders have a variety of tiny homes available along with custom designs to choose from. The builders also offer diy shells for people who like to work at their own pace. Each of the custom Tiny Heirloom tiny homes use quality construction materials and craftsmanship that go above and beyond. 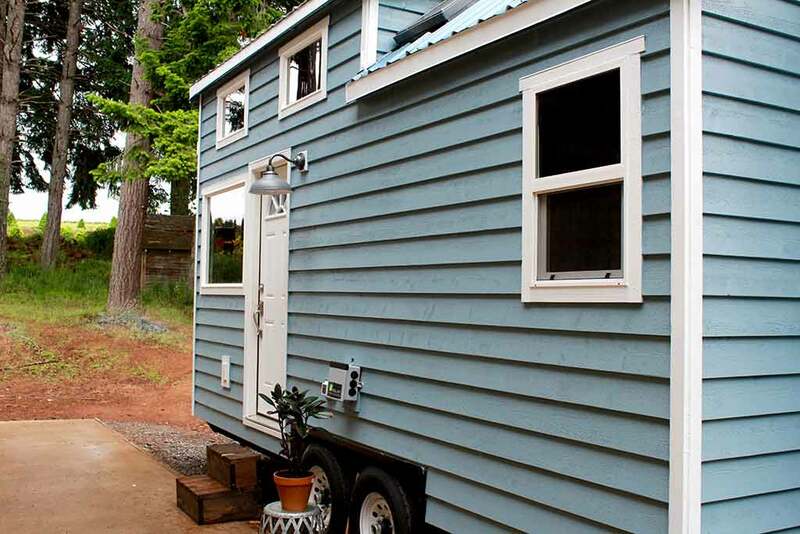 This charming tiny house on wheels lives up to its name with unique details inside and out. The Southern Charm has a wooden exterior with white trim and teal door. Window shutters and a window flower box are just a couple of the details of this lovely tiny home. Inside you have white walls and a peaked roof, with wooden beams, wood floors and trim all around. On one end of this tiny house design, there is bench seating with cushions to match the door, around a table that can fold down for sleeping. There is a good sized kitchen with plenty of cupboard space, an oven with stovetop, kitchen sink and fridge. The stairs that lead to the upstairs sleeping loft have storage underneath. Once upstairs there is a nice space for a bed with plenty of windows, a skylight and a good amount of headspace. There is a washer for laundry underneath the stairs as well. The bathroom has a lovely clawfoot bathtub, a country style sink and toilet. Tiny Heirloom is located in Oregon. Tiny Heirloom has made it easy to have a solar set up incorporated into your tiny house design so you can power it with clean, renewable energy if you choose to do so. Their tiny homes are also built with 100 percent renewable energy. The Cozy Cottage is a tiny house on wheels that has everything you need for small house living. From the moment you look at the exterior with its peaked roof, custom wooden door, window flower boxes and shutters, you will be sure to fall in love. The Cozy Cottage has a nice sized living space with white walls, dark wooden floors and wood trim throughout. The living space has a country style wood stove, a tiny loft for storage, and two closets for more storage. The kitchen in the Cozy Cottage has plenty of cabinet space with a dishwasher, kitchen sink, stove and washing machine. The upstairs sleeping loft is a good-sized space with plenty of headroom and a skylight. The Cozy Cottage has a good sized bathroom, with a clawfoot bathtub. This tiny house design has lots of windows to let in natural light giving this tiny house a spacious feel. 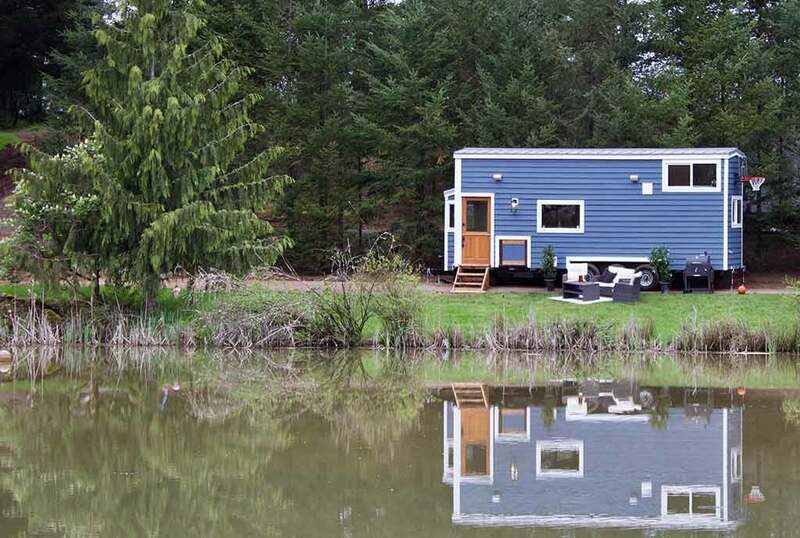 Tiny Heirloom is located in Oregon, and they have a variety of tiny house designs available. On the site, you will also find diy shells, their Signature Series of tiny house designs and custom design options. 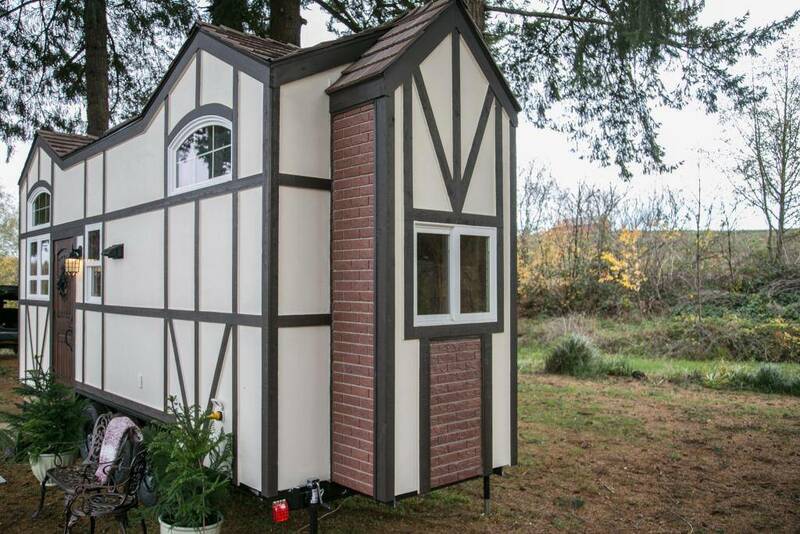 Each of the custom tiny house designs from Tiny Heirloom is unique to itself. Tiny Heirloom builds quality tiny homes that fit your lifestyle and needs. With each tiny house design, you will be amazed by the level of attention and detail that goes into each tiny house design.